The rapid development of aviation during the First World War was mainly aimed at improving the principal characteristics of aircraft-speed, maneuverability, and range. Structurally, airplanes of that period remained descendants of the Wright brothers' very first flying machine-they were still produced from the traditional materials of wood and canvas; structural strength was attained with the help of numerous bracing wires. But there were certain particular warplanes, some of which barely had time to take part in combat, essentially differed from all the rest-the Junkers J I, Junkers CL I and Junkers D I. These airplanes were of a completely new type. They were a great advance for there time-their design consisted entirely of metal. Their design fundamentals were simple-a framework of thin duraluminum tubes was covered with sheets of corrugated aluminium. The ingenious German designer and inventor Hugo Junkers patented this idea in 1912. It became the basis of his theoretical development "of a thick cantilevered wing". After the beginning of the First World War Junkers convinced Idflieg of the potential of his development. The Junkers J I, a heavily armored ground attack plane, made its first flight in the winter of 1916. This airplane has become famous, because none of the Allies could bring down any of these machines during the war. Convinced of the correctness of this development, Junkers began designing a special operational-support plane for the army, the CL I; and a fighter, the D I. The first flight of the J.7, prototype of the future fighter, was in September 1917. The revolutionary design was confronted by a great variety of problems, which were atypical of conventional aircraft-vibration of wings in flight, bad controllability of ailerons, amongst others. But the biggest problem was the absence of a suitable engine, because the best engine was the Mercedes D.IIIa, which developed only 160 hp. It was enough for a traditional machine, but the completely new metal design was much heavier. Nevertheless, the aircraft was sound and not meant for aerobatics, so Junkers persevered with the new technology. During the Second Fighter Competition in July 1918, Junkers entered into competition not only the J.7, but also the new J.9 (D I), with many modifications to the overall design: the shape of the fuselage was changed, the wing span was increased, and the ailerons also were of changed form. The greatest pilots participated in these Competitions, and their observations about the metal machines did appear disapproving-Bruno Loerzer and Hermann Goering recommended it strictly as "an airplane for struggle with balloons and airships". This low-wing monoplane, an unusual design for the time, naturally had a limited view downwards from the cockpit, and this also has resulted in disapproval from the pilots. Nevertheless the Idflieg ordered a series of 40 aircraft, but by the end of the war the Junkers firm had built only 15 machines (12 by February 1919, when all military production was stopped by order of the Allies). The affiliated company, Junkers-Fokker, constructed 13 machines of the D I type. The first aircraft had long fuselages (later ones were to the shorter design). In the beginning of October 1918 these machines were sent to the Flanders sector, but the war approached its end and the Junkers D I was not in time to take much part in the fighting. In conditions of autumn rain Junkers' aircraft had essential advantages over wood and linen types-metal machines were not subject to the whims of the weather, while the canvas and wood of other machines deteriorated all too quickly. After the end of the war the Junkers aircraft had an opportunity once again to prove their advantages: German air forces assisted the governments of the Baltic countries in their struggle against Russia in the spring of 1919. The commander of the division, Lt. Gotthard Sachsenberg, remarked that the metal Junkers D I was the best choice for the constantly adverse weather conditions. Without doubt only two events were truly radical advances in aircraft technology during the First World war-the invention of the gun synchronizer, and the creation of completely metal aircraft designs. The further development of fighter aviation was determined by these two events, and consequently Hugo Junkers rightfully became regarded as one of the parents of modern aircraft. Thanks to Roden for the historical background. 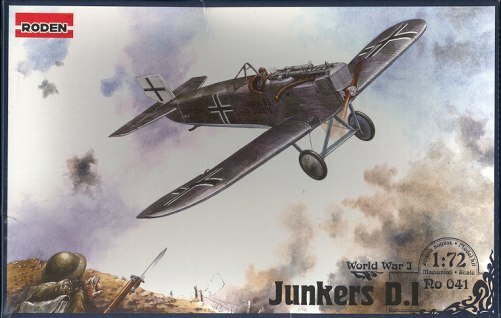 Roden's Junkers D.I is one of their better molded kits. The corrugations are extremely well done and have to be seen in person to really be appreciated. There is one sprue that is what I'd call 'basic German aeroengine' that has been used on a number of other German WWI projects like their Albatros and Fokker fighters that is not shown. 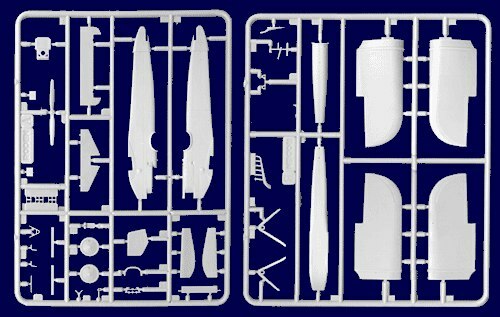 It makes good marketing sense to include this somewhat generic sprue and it cuts down on development costs. The ot her two sprues are brand new and on my example were totally free of flash, sink areas (which on a corrugated surface would be impossible to properly fix), or ejector pin marks. I did notice that the exhaust had rather prominent mold seams and the generic sprue was a bit flashy, though minimally so. From what I could see, there were not really any optional parts and frankly, for a plane that saw such little combat, you'd be surprised if there were. I do like the idea of separate elevators and ailerons as those kinds of thins add some life to an aircraft. Instructions are quite well done and typical of what Roden has been doing in the past years so no need to really dwell on that aspect. The decals are very well printed and for two aircraft; differing only by the serial number. I have to approach Roden decals with some caution as they have not been very amenable to setting solutions and have shown a tendency to be brittle. Though one doesn't know until it is time to use them, I hope these are an improvement because they have to be able to snuggle down into all those corrugations. I'd have a set of aftermarket insignia around just in case. 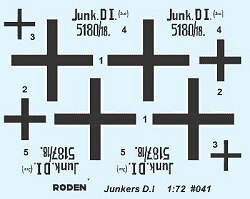 Thanks to Roden, we now have a mainstream Junkers D.I. Previously it was only available in this scale as either a resin kit or a short run version. Thanks to its cantilever design, this one won't need any rigging save for two wires on the landing gear. For those who like old planes but suffer from rigging-phobia, this is a perfect model for you!